Sarepta Therapeutics bucks the market downtrend in August following FDA acceptance of its new drug application for eteplirsen. Can its stock head even higher? Shares of Sarepta Therapeutics (NASDAQ:SRPT), a clinical-stage drug developer predominantly focused on developing treatments for patients with Duchenne muscular dystrophy, a rare disease that affects the protective sheath surrounding muscle fibers, rose 12% in August, based on data from S&P Capital IQ, despite general market weakness. 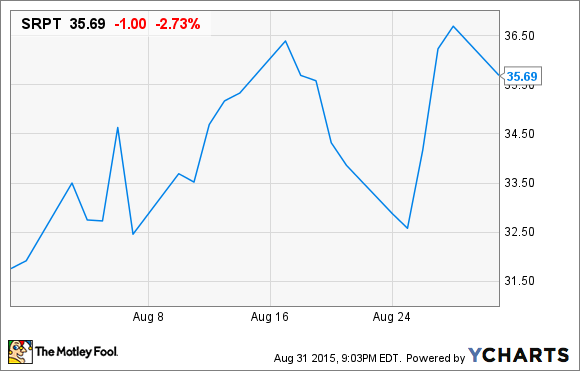 Three factors played a role in pumping up Sarepta's stock price in August. To a lesser degree, receiving the pediatric disease designation for eteplirsen, its exon 51-skipping experimental DMD therapy, from the Food and Drug Administration played a role, as did an upgrade from Piper Jaffray to "overweight" from "neutral." Jaffray also increased its price target on Sarepta from $28 to $48. However, the big catalyst came on Aug. 25, when the FDA announced that it had accepted Sarepta's new drug application filing for eteplirsen, granting it priority review status and setting its PDUFA decision date for Feb. 26, 2016. Sarepta has no approved therapies on the market, and exon 51 accounts for the largest percentage of DMD cases at 13% (there are a lot of exon-based mutations). Of course, Sarepta isn't the only pony in town when it comes to DMD therapies targeted at exon-51. BioMarin Pharmaceutical also has a drug under FDA review: drisapersen, which it acquired when it purchased Prosensa. Drisapersen's PDUFA date is Dec. 27, 2015 -- about two months earlier than eteplirsen's. Looking ahead, investors should keep an eye on the advisory committee meetings, which are expected to happen in November, as well as potential post-marketing study requirements. The advisory committee will offer its advice on whether both drugs should be approved, and it's likely that the FDA will defer to the committee (although that's not a given). Drisapersen's previous failure in phase 3 could come into play, as could Sarepta's previous inability to communicate the causation of increased dystrophin production and improved six-minute walk test results to the FDA. So should you purchase Sarepta? If you have a mile-high risk tolerance and an iron constitution, then it may not be a bad bet. Orphan disease drugs like eteplirsen command a high price point if they're approved, so it could give Sarepta enough cash flow to further its research and eventually turn profitable within three or four years. But eteplirsen by itself will only have peak annual sales potential of somewhere in the $600 million-$700 million range, based on Wall Street estimates. This means Sarepta's $1.5 billion valuation is already a bit aggressive, based solely on eteplirsen. Then again, an approval of eteplirsen could validate Sarepta's exon-skipping platform and push its stock higher. It's really a tough call to make on Sarepta, as it could easily swing in either direction, but I'd keep my distance until we have a look at what the advisory committee has to say.